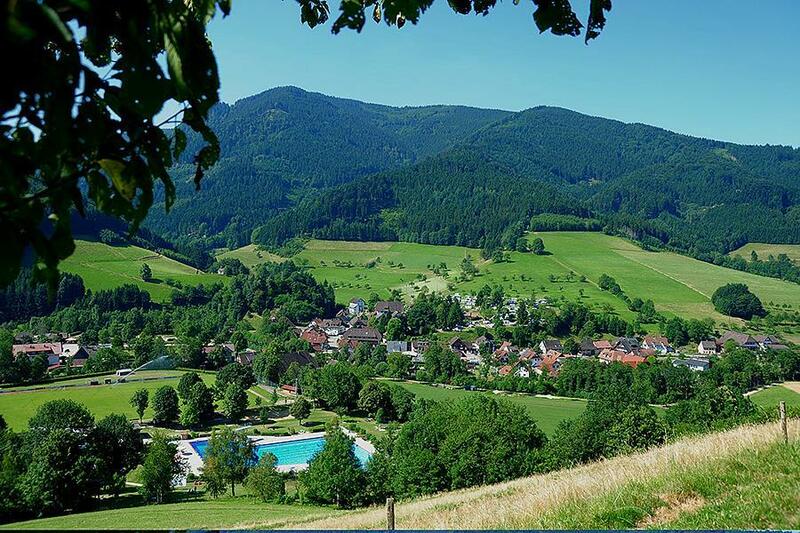 Camp for €20,- a night at Campsite Schwarzwaldhorn in low season with CampingCard ACSI. Campsite Schwarzwaldhorn, located in Simonswald (Baden-Württemberg), is a campsite with 36 touring pitches and 17 year round pitches. With your CampingCard ACSI you can camp on one of the pitches during the following periods: 01-04-2019 - 01-07-2019 and 01-09-2019 - 20-10-2019. At this campsite you can not only use your CampingCard ACSI for inexpensive camping, you can also use your ACSI Club ID (as an alternative ID). Small friendly campsite in a little village with plenty of walking opportunities. Beautiful views of the Simonswald valley. Swimming pool within walking distance. One free hour of wifi a day. This is a lovely site with lots of beautiful views of the surroundings mountains. The site owner was very accommodating to us as we had a large repair to our van and were very grateful for the loan of his drill and assorted screws. Lovely little towns within a short drive , delicious bakery just down the road. Two night stay in September in a tent. Very friendly and accommodating owner who guided us to the available pitches. Clean and well maintained facilities. Small shop on site. Tiered and level pitches better suited to camper vans and caravans as pitches can be muddy when wet. Access through town with a tight turn into campsite. Cars are parked away from the pitches. Nice little town with usual eating and drinking facilities at very reasonable cost. Good base to explore Friedburg and surrounding area. We spent 3 excellent nights at Schwarzwaldhorn last week and have nothing but good things to say about our experience. From the moment Rudolph, the campsite owner, greeted us with a warm smile we were made to feel welcome and enjoyed the site and its surroundings. The difference with this site which makes it memorable was Rudolph and his lovely wife Regina. They take great pride in their site and also in their local area and are extremely helpful giving suggestions on things to do. We used the free bus and rail pass that comes with the pitch price to go into to Freiburg which was great. The toliets and showers are very clean and modern. The shop sells all the basics plus a great selection of local beers - very good!! This is an ideal site to use as a base for the southern/central part of the Black Forest. There are limited spots for motorhomes and so it might be best to book ahead. we were lucky. Very well located site, supermarket, bakery,cashpoint and Tourist Info office all within 10 min walk. Free bus/ train tickets included in the guest card, and entrance to local swimming pool. We chose to take the bus and train to Freiburg and the next day in opposite direction to Furtwangen. Freiburg was an interesting town, Furtwangen just a small town with 2 large supermarkets but the journey has some spectacular views. Not having researched the journey to Freiburg we initially followed the crowd to the right after alighting from the train....the old town is to the left, we didn't notice any signs but I am sure there must be some! On the day we went there was a substantial market. Awfull pitch, very difficult to get on and off, could not level the van owing to tree roots, but superb views. We were told this was the only space available, and probably would not have accepted it if it had been earlier in the day, however the owner could have turned us away. Friendly welcome. Entertainment one evening, an accordion band, which we enjoyed. Appears good for children with dedicated staff for activities, for example there is some children's art around the buildings and one evening they were supervised cooking sausages on long sticks over a camp fire. There is a baby bath style sink etc, good San FACS, clean and modern, small well stocked shop. Schwarzwaldhorn is a lovely place to stay, very close to town center (small town center, but it has all you need - bakery, resturants, etc.). The scenery is peaceful and quite, the facilities are very clean. The big advantage of the place is the manager, who is very friendly and speaks fluent English. He was very nice and helpful. The campsite is set on a hillside in a village in a beautiful location. Most pitches have lovely views across the valley and are set on terraces. Part of the site is for permanent pitches. Cars are parked in a separate area, not beside the caravan or tent. There is a small shop and fresh bread can be ordered daily. The village has a bakers and a supermarket as well. There are also plenty of eating places in the village and lots of sights and places of local interest nearby. There is free local public transport - we used bus and train to go to/from Freiburg and it was excellent. The owners were extremely friendly and helpful (both spoke good English) and were really excellent help throughout. The toilets/showers/etc were excellent - always spotlessly clean, like new and tidy and plenty of them. In general an excellent and well run site that we would recommend to anyone. This is a beautiful site. The family who run it are very helpful and friendly and speak very good English. The toilet facilities are lovely - modern and immaculately clean. When you stay at the site you get a visitor card which gives you free access to the town outdoor pool which is very close. An excellent site, very well run. Owmers very helpful and friendly. Hope to visit again in 2013. Surrounding area very peaceful. Would you like to book Campsite Schwarzwaldhorn or request more information? You can do both using the information below or by visiting the campsite's website. Take the A5 Karlsruhe-Basel, exit Freiburg-Nord. Then take the B294 direction Waldkirch. Through the tunnel and take the 2nd exit direction Simonswald. Straight over the roundabout from Ortseingang Simonswald. The campsite on your right after about 4 km. CampingCard ACSI will send your information request to "Campsite Schwarzwaldhorn".